The Cleveland Triathlon returns for its 33rd year to Downtown Cleveland on Sunday, July 21st. It starts with a super-safe swim at North Coast Harbor, a bike ride on the closed-to-traffic Memorial Shoreway, and the new run finish will be at the University Hospitals Gate at First Energy Stadium. Every participant will be welcomed at Packet Pickup at UH Ahuja Medical Center on Saturday, July 20th, and includes our great Pasta Feed that is complimentary to all, Course Talks and tip and advice from the UH Sports Medicine Institute. Each entry includes custom swim cap, race bib, official t-shirt (in male and female sizes), race photos, timing, and all safety teams, road closures, and security on the course PLUS the great medical support from University Hospitals. A cool 33rd Annual Cleveland Triathlon medal will await you at the finish! Packet Pickup: UH Ahuja Medical Center. Saturday, July 20th. 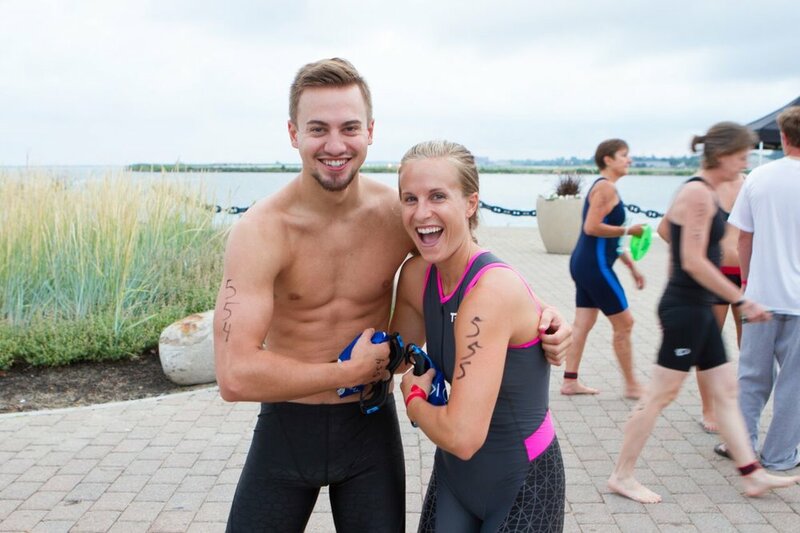 The Cleveland Triathlon has a distance and experience tailored to each participant from beginner to seasoned warriors. SuperSprint Triathlon. Geared for beginners, those looking for a super-short race or for a fun family and friends race. It begins with a 300 yard swim in the north coast inner harbor. Flat, no waves, and water temps in the mid-70’s. The bike is one loop, 8 miles, of our closed-to-traffic Memorial Shoreway (yes, it is on a freeway without traffic) and the downtown run finishing at the University Hospitals Gate at First Energy Stadium. Our most popular distance. Starting with a flat water, no wave swim in the inner harbor of Downtown Cleveland of .4 miles. 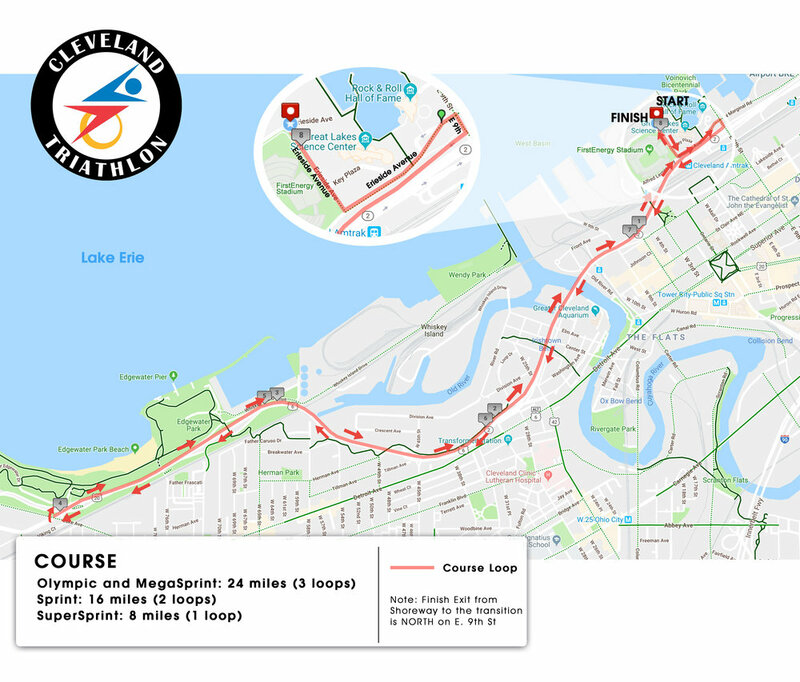 Bike course is 16 mile on the closed-to-traffic Memorial Shoreway (2 loops of 8 miles each) and finishing with a 5k run that concludes at the UH gate at First Energy Stadium. For those who want the longer bike and a shorter swim and run, we created the MegaSprint. 24 mile Olympic Bike paired with the .4 mile swim and 5k run of the Sprint Course. A cool alternative. For boys and girls 6 -14, we have a distance that is geared toward the kids. 100 yard swim, 3 mile bike, and 1 mile run. Note: We let younger racers compete in the SuperSprint triathlon with the family members or friends. In the Youth race, kids only. UH Rainbow offers the most expansive pediatric care network in Northeast Ohio, with more than 740,000 annual patient encounters at 131 service locations. The vast network includes nationally-ranked UH Rainbow Babies & Children’s Hospital — Cleveland’s only full-service, freestanding children’s hospital with a medical staff of more than 745 physicians and Northern Ohio’s only Level I Pediatric Trauma Center – along with a primary care network of more than 200 pediatric and family medicine providers at 83 offices, inpatient care, pediatric emergency services, urgent care centers, surgery centers, medical and surgical specialty clinics, and advanced newborn and maternal/fetal medicine services.